i decided on a separate post for the MUFE part of my Sephora friends & family haul. i had some brushes that shipped much later than expected due to the inundation of orders that Sephora had over the sale time. it completely overwhelmed their warehouses, but they were nice enough to reward me with an extra 500 points to my account for the delay, without prompting. i grabbed the Travel Brush Set, Metal Palette in L, artist shadows in S312 Mint Green, D334 Apple Green, D306 Bottle Green, S718 Salmon (technically classified as a blush), I804 Golden Pink (also technically a blush), D830 Black Rose, brushes in: 238 Medium Smudger Brush, 256 Definer Eyeliner Brush, 218 Medium Blender Brush, 208 Small Precision Shader Brush, 220 Small Shader Brush, 174 Small Concealer Brush, and the Artist Palette! The Metal Palette is only carried in the XL size online, but if you can access one of the Sephora branches with a MUFE boutique inside, you can find them in different sizes. the smallest holds 4. L size i have will hold 18. they’re currently taking up more space than they should because i still have half the packaging attached to it until i can find a sharpie to write down the color numbers to the back. the metal palette is strongly magnetized and sturdier than a Z palette. however, it’s also pretty hefty in weight, 4.25oz. i may decide to return this for the plastic trio palettes instead. 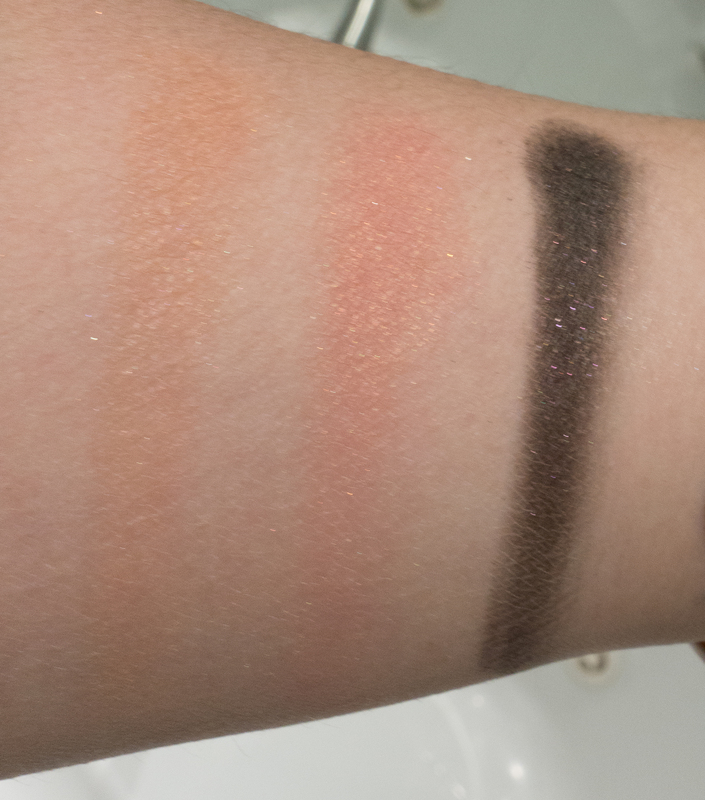 now how about some swatches? 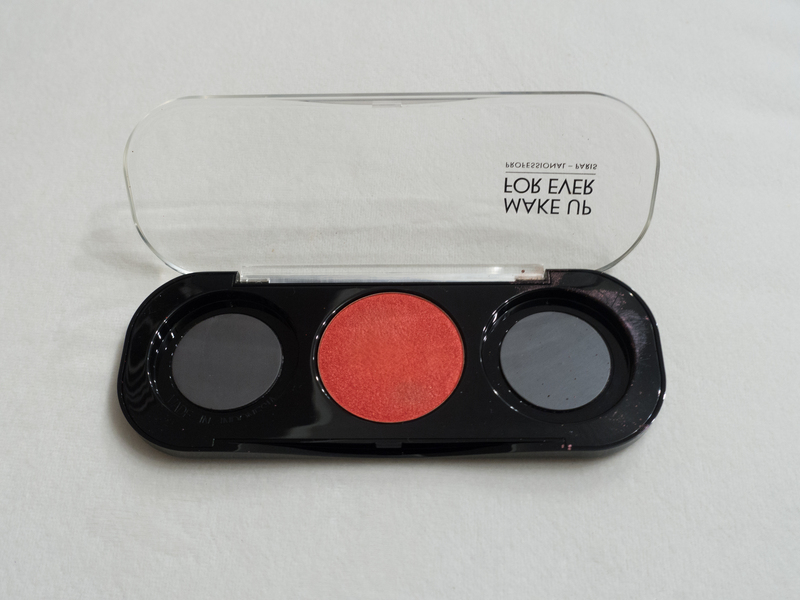 btw, MUFE only gave their artist shadow number codes, the names you see next to them are a Sephora designation. if you walk into a boutique and ask for a shadow by name instead of number, they will give you a blank look. 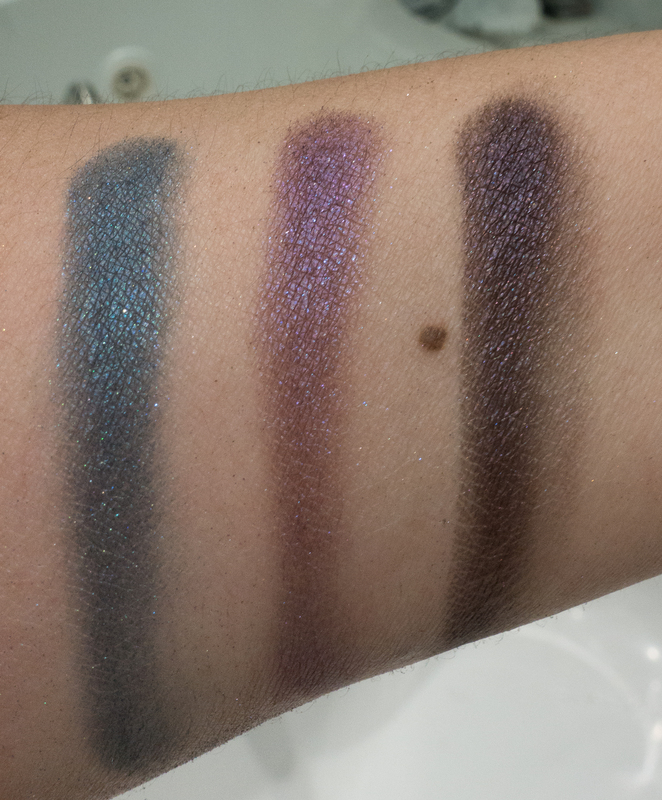 also a tip on using these shadows from the MUFE shadows from the makeup artists, if you want a more pigmented and metallic sheen, press down and drag the shadow to intensify the pigment. be sure to click on the individuals pictures so that you can see them expanded to showcase their sparkly glory. S312 Mint Green is a medium mint green. D334 Apple Green is a light sparkly apple green with golden sparkles running through it. i think it’s such a happy color. D306 Bottle Green is a blackened hunter green base with emerald green sparkles running through it. S718 Salmon is a warm, peachy shade. I804 is a medium pink base with a peachy gold sheen. D830 Black Rose is a deep black with purple sparkles running through it. i grabbed this because i’ve always loved Blackheart in the Urban Decay Naked 3 palette. however, i didn’t feel like i would use the palette enough to justify buying. D830 Black Rose swatches beautifully, and i can’t wait to try it. i feel the Black Rose is very similar to Black Heart. i believe that Black Rose is a slightly deeper black with purple sparkles while Black Heart has pink sparkles. the Artist Palette contains 8 shadows: M536 Milk Tea, I524 Pinky Beige, I550 Olive Grey, D652 Celestial Earth, ME728 Copper Red, ME 230 Peacock Blue, D926 Blueberry, and ME930 Black Purple. 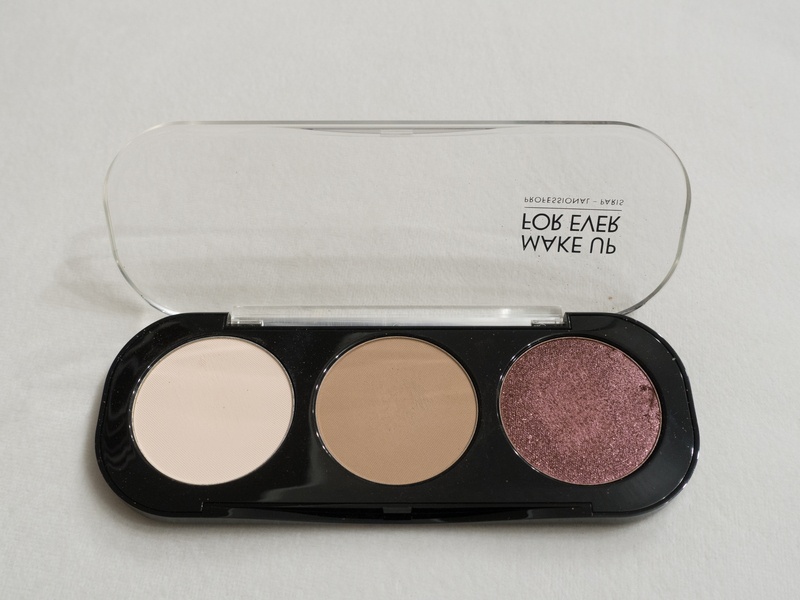 there have been tons of reviews on this palette, so i won’t bore you with color descriptions. i’ll just say i completely agree with all the raves, and i personally have never experienced a palette that had no duds/disappointments. although, i did use a grey card to color balance these pictures, Olive Grey does look a bit off on my screen (my screen still needs to be calibrated). in person, it’s a warm taupe with a cool grey sheen with a little bit of iridescent sparkles running through it. D652 Celestial Earth looks a little deeper in real life than this swatch. here’s a closer look at ME930 Black Purple, so you can better see its dual chrome nature. technically, not part of my Sephora friends & family haul, but i have a few more shadows in my stash. i figured i might as well add them to the swatch fest. for those of you that didn’t know, like me, don’t underestimate MUFE’s attention to detail! you are not forced to pry the magnetized shadows out of the palette by wedging your tweezers into the crack between pan and palette while being distracted by your boyfriend. those 3 tiny holes up top is for you to stick a push pin or needle through to help you switch out colors easily. if only i had realized this before i damaged my beautiful Fig! i love this trio so much i had to show you a close up so you can see the color and sparkles better. from left to right: M530 Eggshell, M536 Milk Tea, D826 Fig, ME744 Poppy, ME512 Golden Beige, D320 Golden Khaki, and ME624 Black Gold. M530 Eggshell is a slightly warm creamy white. i use it as an all over base shade/brow highlight. 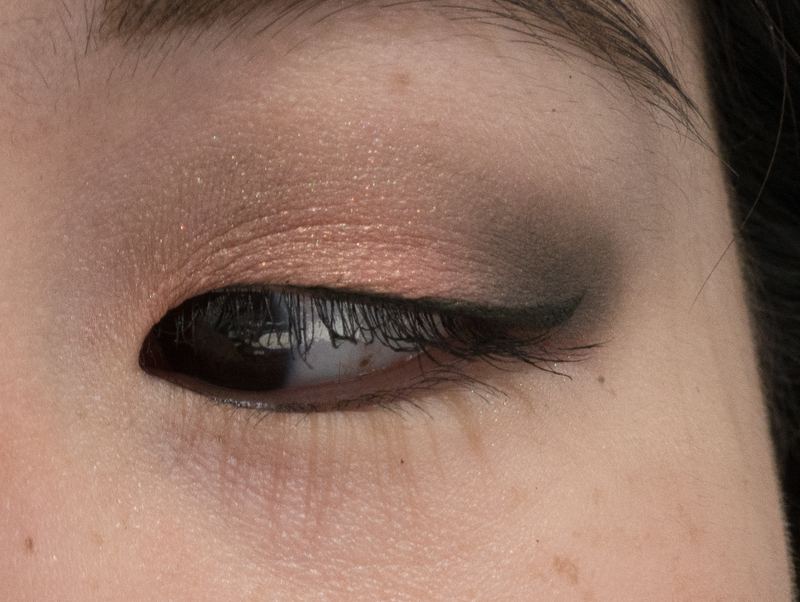 it’s pigmented enough to hide the discoloration from the veins on my eyelids. it’s a tiny bit powdery compared to the other finishes but still very blendable. 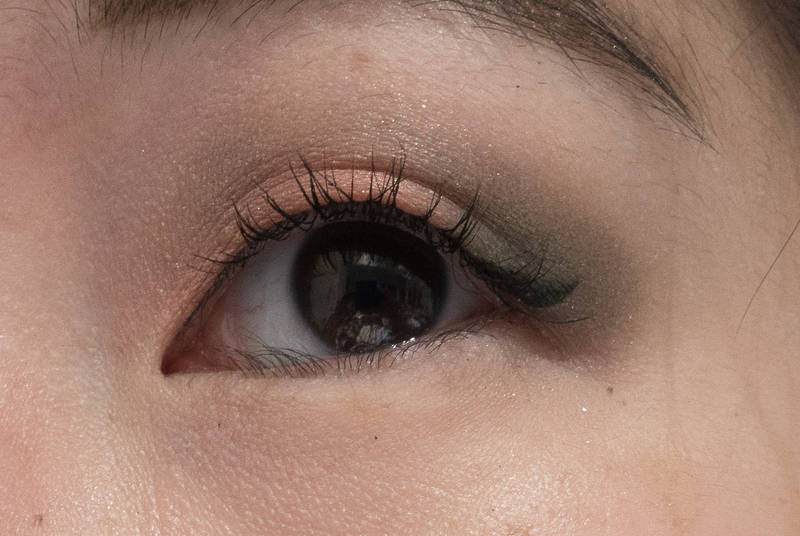 M536 Milk Tea is a great transition/crease shade for those with paler skin. D826 Fig is another color where the swatch doesn’t do it justice. it’s a beautiful warm plummy brown with a heavy dose of red overtones and lots of pink sparkles running through it. it looks almost metallic. 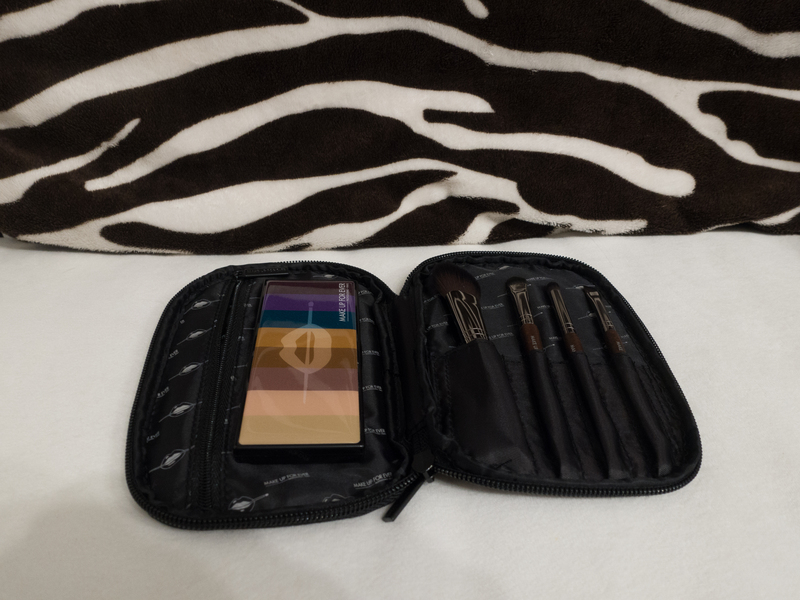 the set includes travel size versions of brushes: (L toR) 150 Precision Blush Brush, 228 Medium Precision Shader Brush, 216 Medium Precision Eye Blender, and 172 Precision Corrector Brush. 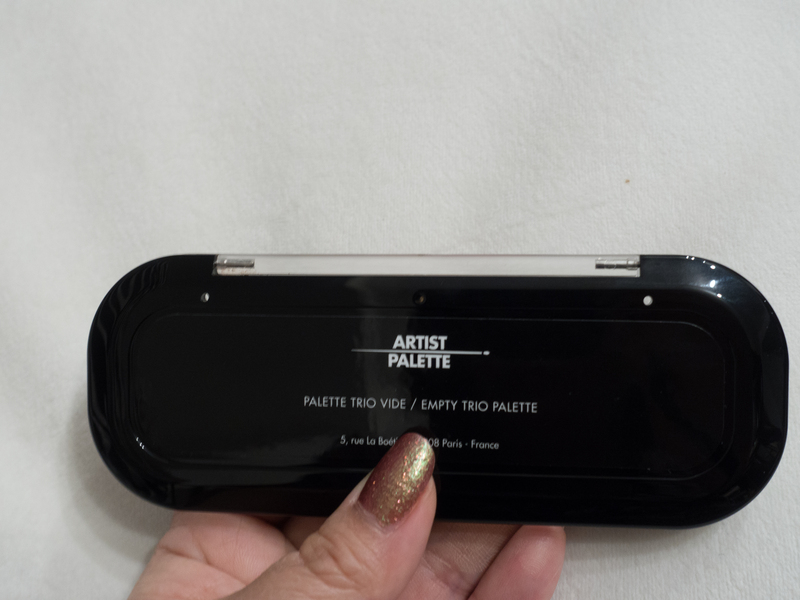 the flap has an pocket which will fit either the Artist Palette or one custom trio palette. 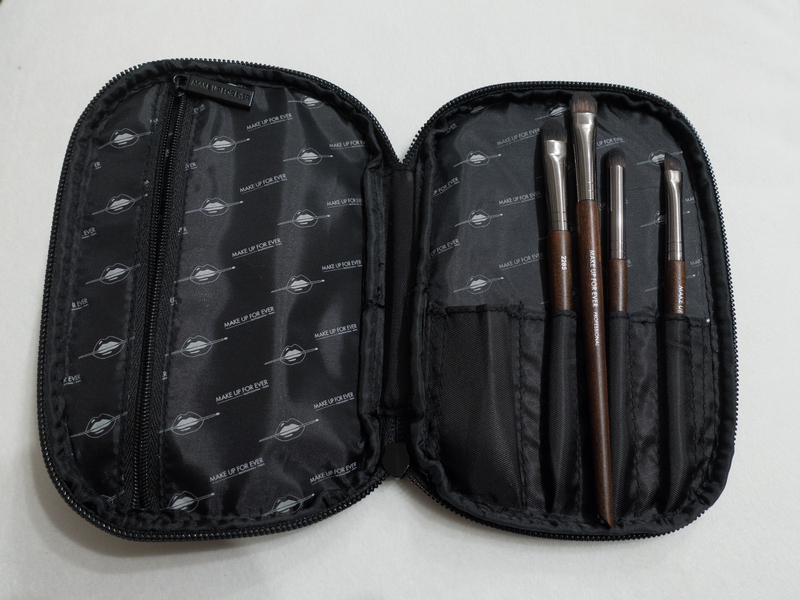 it looks like the middle of the case is just barely long enough to fit a couple of full sized brushes. if you zoom in, you can see that the 228 Medium Precision Shade brush is almost identical to the full size one. i also have 216 Med. Precision Blender in the full size, and they look exactly the same. 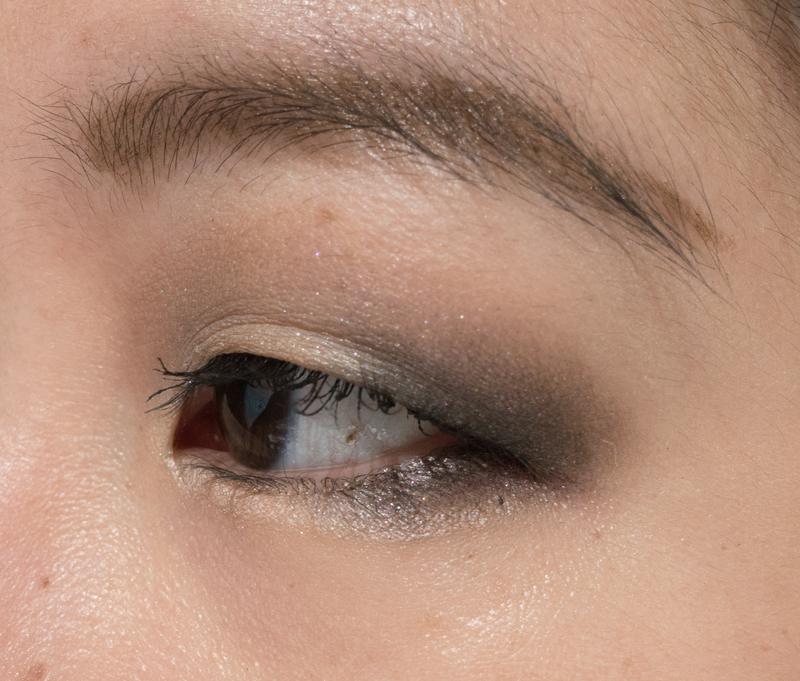 how about a couple of looks to see how the shadows are in action to finish things off? the purple sparkles in D830 are very subtle, but it blends beautifully with no glitter fallout. the black can be much more intense than this without a lot of building. it just wasn’t the look i was going for that day. 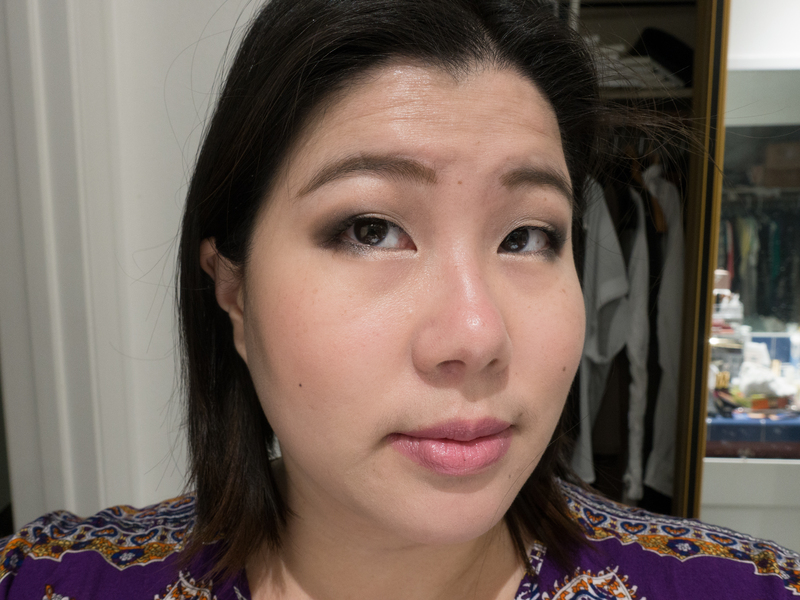 i was so excited to try out D830 that i forgot to use eye primer! all the rest of the looks below do have primer. 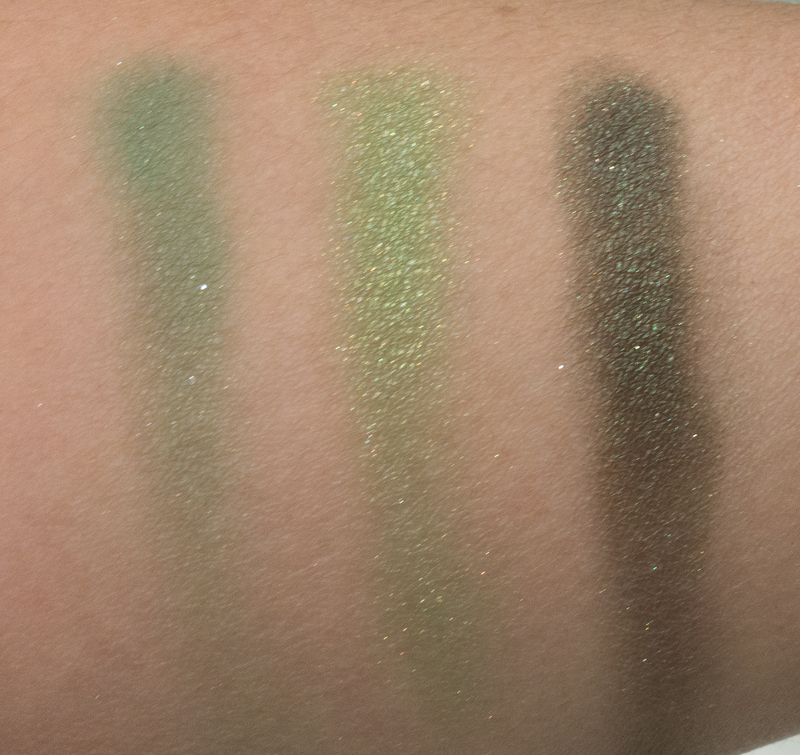 Readers, have you tried the reformulated MUFE artist shadows? what do you think of them? Whoaaaaaaa so much MUFE! 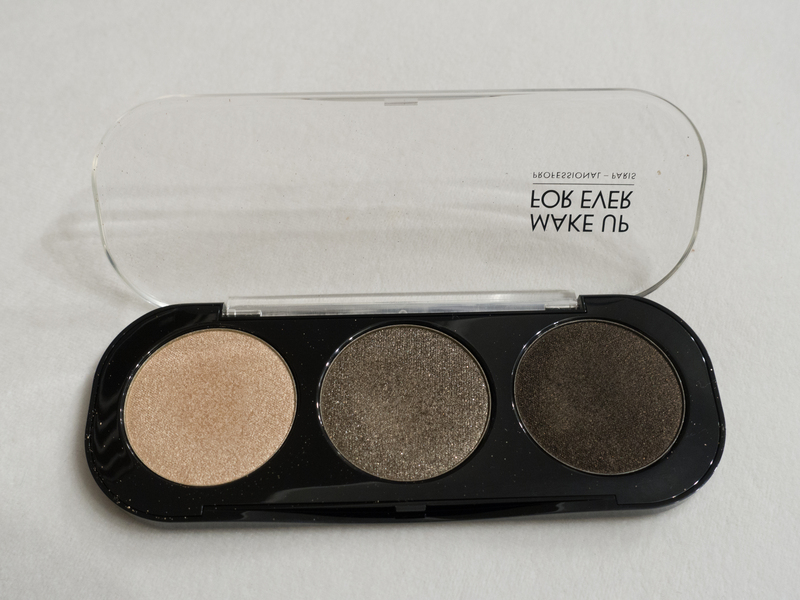 I LOVE the “trio” you put together with Golden Beige, Golden Khaki, and Black Gold! The latter two are definitely on my wish list! You put two beautiful looks together as well, especially the second one! thanks, sunny! the golden khaki trio is my personal favorite too! i acquired it in vegas after 4 afternoons of swatching the 200+ colors. the more you swatch, the more confused you get 😛 honestly, that trio is probably my favorite out of everything i own. it goes with everything! if you acquire them, please share your looks with me! Superb haul! I’m so happy that you are loving your mega MUFE purchases! My favorite is definitely the trio you put together with Golden Khaki, and that’s definitely my very favorite of the shadows! 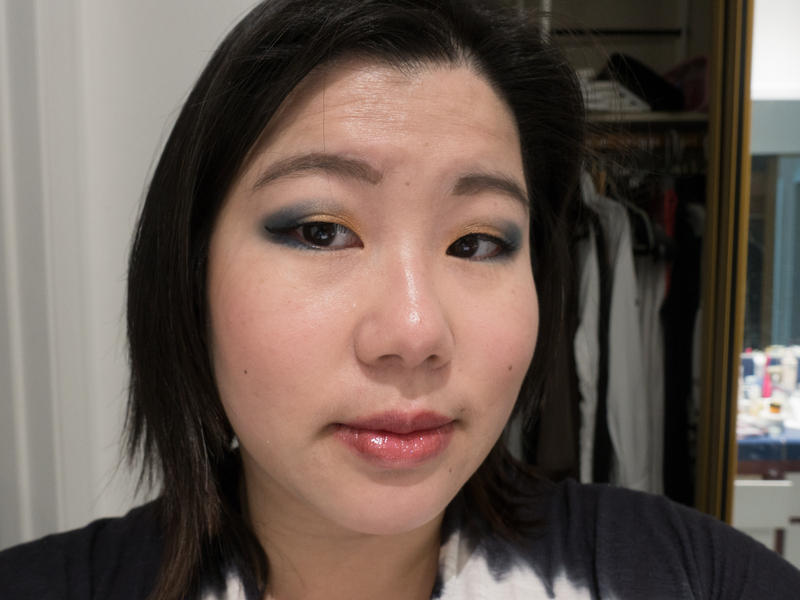 I absolutely love colors like that because they are so easy to wear! I love the looks that you created they are so beautiful! me too! 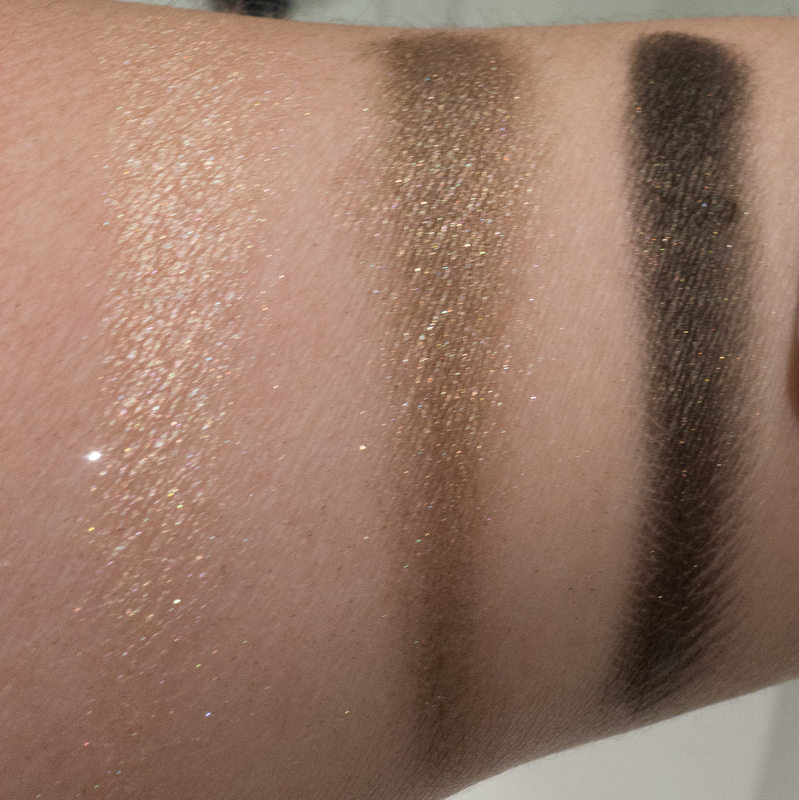 in fact, syl recently asked in one of her questionnaires if you could only wear one shadow for the rest of your life what would it be and i answered golden khaki! khaki/olive green are my favorite kind of neutrals. i feel like they go with any outfit. thanks for the compliment and i hate to break it to you but if you need my lip color, i’m going to have to add to your wish list. i was wearing YSL’s kiss and blush in Rose Frivole that day. Is that Gemma on your lips in the first picture? It’s gorgeous on you! gahhhhhh I need that color! I’m so glad you love my favorite trio, Lotus! it’s my favorite neutral look and if you want to be enabled, the trio comes down to $14.66/shadow if you buy them as a trio palette instead of the individual prices of $21. or $17 if you buy as a duo. on Sephora, the discount is linked to the palettes, so don’t skip adding them into your cart. they’re $1 each. thank you! those words mean so much to me. sometimes it can get discouraging because it feels like your writing just goes out into a void. kind words like yours really help keep me blogging!